Three-time Ricoh Woodbine Mile-winning trainer Neil Drysdale will be taking aim at a record grand slam in the Grade 1 Breeders’ Cup Challenge Series race on Saturday, Sept. 15, this time pinning his hopes on filly La Sardane. In 21 editions, only two other female runners have won the Woodbine Mile: Tepin (2016) and Ventura (2009). Owned by Team Valor International, La Sardane was riding a three-race win streak into her Woodbine debut on August 25 in the Grade 2 Play the King Stakes but finished fifth behind local champion Mr Havercamp after setting the pace in the seven-furlong event over a yielding turf. “She couldn’t handle the ground. It was too soft for her in the Play the King,” said Drysdale, noting the four-year-old French-bred filly remained at Woodbine following the race and worked well yesterday breezing six furlongs on the turf in 1:12.40. La Sardane’s previous stakes wins include the Grade 3 Intercontinental over seven furlongs and the Perfect Sting over one mile, both on turf at Belmont Park. While racing in France under the tutelage of Bruno de Montzey at age two and three, the Kingsalsa-Foresta filly also won the Group 2 Prix de Sandringham over the one-mile Chantilly turf course. Based at Santa Anita, the Hall of Fame trainer has sent out 11 starters in the Woodbine Mile, winning his debut with Labeeb in 1998 and later editions with 2003 champion Touch of the Blues and 2006 winner Becrux, co-owned by Team Valor. He also won the Molson Export Million, the precursor to the Mile, in 1989 with Team Valor’s Prized. While Drysdale has enjoyed tremendous success in this race before, he laments the 1999 edition in which his trainee Hawksley Hill was disqualified as the winner and placed fourth after judges ruled in favour of an interference claim of foul in the stretch. Drysdale’s last win at Woodbine was in the 2010 Grade 2 Sky Classic courtesy of double millionaire Marsh Side, who also captured the Grade 1 Canadian International and Northern Dancer Turf Stakes in preceding years. In addition to La Sardane, Vexatious will be running against the boys in this year’s $300,000 Northern Dancer featured on the Woodbine Mile undercard. Owned by Calumet Farm, the four-year-old daughter of Giant’s Causeway and Dream of Summer is the only filly nominated to the 1-1/2-mile Grade 1 stakes. Vexatious was a solid contender in graded stakes action during her sophomore year with top three finishes in the Grade 2 Fair Ground Oaks and Grade 3 Fantasy Stakes at Oaklawn Park as well as running fourth in the Grade 1 Kentucky Oaks at Churchill Downs. She is heading into her initial graded event of the season, coming off her first victory since a maiden win at two. “She beat a good filly the other day going a mile and three-eighths and we always felt she was a mile and a half filly so we’re going to try,” said Drysdale, referring to Vexatious’ mid-August victory on the turf in the CTT and TOC Stakes over graded stakes winner Queen Blossom at Del Mar. The Kentucky-bred filly, who is a full sister to multiple graded stakes winners Destin and Creative Cause, arrived at Woodbine on Tuesday morning and breezed six furlongs on the turf yesterday in 1:14. Both La Sardane and Vexatious will be ridden by jockey Rafael Bejarano, who last raced at Woodbine in 2009 and was victorious in the Grade 2 Canadian Stakes aboard Princess Haya. That year he was runner-up in his first Mile start in rein to Ferneley. 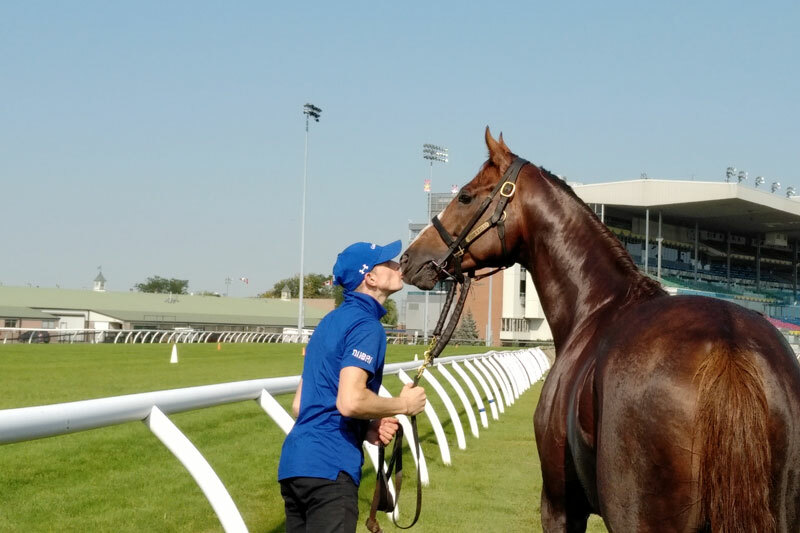 Trainer Charles Appleby will be represented by a pair of talented Godolphin runners on next weekend’s lucrative Ricoh Woodbine Mile undercard. Hawkbill, a multiple Group 1 winner, will be taking his second attempt at the Grade 1 Northern Dancer Turf. Last year, the now-five-year-old son of Kitten’s Joy finished second, by a head, in the $300,000 1 1/2-mile turf marathon to local hero, Johnny Bear. La Pelosa, a two-year-old daughter of Dandy Man, will take part in the Grade 1 Natalma Stakes, which is a ‘Breeders’ Cup Win and You’re In’ event contested at one mile over the world-famous E.P. Taylor Turf Course. The duo arrived just after the conclusion of Saturday’s Woodbine card from England by way of Frankfurt, Germany. Hawkbill arrives in good order ahead of Saturday’s turf test. “He’s getting older, but he will try. He always puts his heart into it. Hopefully he can have a little revenge on last year when he got beat by next to nothing at the post,” said Chretien. La Pelosa boasts a record of 1-2-1 from five starts and will be stretching out to a mile for the first time in Sunday’s Grade 1 challenge. “She’s a nice scopey, big filly. She’s strong and athletic,” said Chretien. Fans will have the chance to meet some of Woodbine’s stars during a Jockey Meet and Greet autograph signing session on Ricoh Woodbine Mile day. The Meet and Greet session will take place in the grandstand on the second-floor concourse from 12:15 p.m. to 12:45 p.m.
Saturday’s action-packed program will begin at 1 p.m., featuring the Grade 1 Ricoh Woodbine Mile, Grade 1 Northern Dancer Turf Stakes, Grade 2 Canadian Stakes, Presented by the Japan Racing Association, as well as the Grade 3 Bold Venture Stakes and the Sweet Briar Too Stakes.